We had a request for several specialist acoustic doorsets for a project based at Liverpool John Moore�s University, the Byrom Street Site. In total we supplied fifteen doors on this project. Every one of the doors supplied were finished to our usual professional, high standard. Two of the doors were 65mm thick and were supplied in a pair, 38dBRw specification. The other 6 doors came in a combination of pairs and singles measuring in at 55mm thick doors, 37dBRw. These six doors were pre-hung in the factory in CND Beech frames and some were inclusive of factory glazed vision panels. The vision panels were 16mm Pyrobel glass in line with the acoustic evidence for the doorsets. The doors were faced in Polyrey Laminate, Gris Averse G013 to specification, with exposed solid maple lippings on all of the four edges. A further seven doorsets were requested in the same finish laminate in sizes 44mm and 54mm, the finished thickness to NFR, FD30 & FD60 applications. These doors were once again all pre-hung in matching hardwood frames. The doors were pre-prepared for ironmongery to be applied with all non-protruding ironmongery factory fitted, which helped save on cost and time spent on site works. On receipt of the doors, everyone was extremely impressed with how they looked and the high standard of them. For more information about this door or for any other queries then please do not hesitate to contact us on 01254 777142 or email info@bcs-l.com. Are you a person who likes to get your groove on? The E-Wood Veneered Door with a feature groove is perfect for you, it is not your average plain smooth door. Beautifully handcrafted, this veneered door can be made to measure and comes complete with a grooves which run down the door surface. The picture shown here is the E-Wood Veneered Door with a feature groove the in the American White Oak finish although there are other options available. The faces of the doors have this feature groove in order to give an FLB effect and they can be produced either with a glazed vision panel or without one. Furthermore, the doors can be supplied in any application such as FD30 or FD60 fire doors, acoustic versions and NFR. Bespoke Complete Services can even service the door so that it includes vision panels, letter plate cut out, ironmongery preparation, hinge recession and preparation as well as glazing beads. These can be applied to any of the E-Wood door range not just the E-Wood Veneered Door with feature groove. I would like someone to call me about this particular door. For more information on how you can get your groove on then call Bespoke Complete Services on 01254 777142 or email info@bcs-l.com. As a legal requirement due to specific building codes, buildings now must be fitted with emergency exits. These have to be made in accordance to specific requirements laid out in these codes which include number of doors and specific sizes. An emergency exit is a special door used for exiting a building in an emergency such as a fire. They allow for faster evacuation and without them we would see a lot more fatalities. In most cases normal routes of exit become blocked and thus the emergency exits provide an escape route. Bespoke Complete Services can design and manufacture emergency exits which will meet the legal requirements set out and ultimately can prove life saving within an emergency situation. 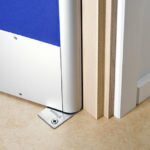 Our emergency escape doorsets come complete with a push pad or panic bar emergency release mechanism that allow quick release when an emergency occurs & panic ensues and simple things like opening a door become impossible. Through using panic release bars or push pad then it means people just have to simply apply force to this and the door will open. These doors can be completed in just 7days and supplied either in white for on-site decoration or can be fully finished to any RAL colour. Specifically located emergency exits have to be clearly marked with exit signs throughout the building leading to this exit. Real life cases, inclusive of the attacks on the World Trade Centre on September 11th 2001 some of the emergency exits were inaccessible others were locked! Furthermore the well known incident of the Station Nightclub where they filled it over capacity and a fire broke out, the emergency exit swung inwards and not outwards as the code required! Only an amateur or a cowboy would make these mistakes, it is not that but you are putting people’s lives in danger. For a professional emergency exit which will be manufactured and fitted correctly then contact the professionals. Our prices are extremely competitive after all who can put a price tag on life? For more information or to get a quote then contact Bespoke Complete Services, 01254 777142 or emailinfo@bcs-l.com. Timber screens by Bespoke in hardwood and softwood & MDF. Any type of timber screen can be produced by Bespoke Complete Services. We are able to manufacture any size timber screen for your specific requirements and needs. When completed the screens really do look professional and extremely smart. The minimum frame depth is 32mm and this is a usual requirement however, any frame depth and thickness can be accommodated so that any criteria needed are met. Our timber frames and timber screens can be manufactured and supplied simply on their own without glass or we can offer them with an option on loose glass & also a fully factory glazed version. The timber screens can really make the difference to say a function venue, making it easily accessible by those using it. Glass can be frosted to allow restricted visibility or completely clear for full visibility into the room. Large wall depths can be accommodated easily through extension linings, screens can be manufactured as a lining and thus additional loose planted stop, a one piece rebated frame of a split frame. For more details regarding our Bespoke Timber Screens or for any other queries then please call our sales office on 01254 777142 or email info@bcs-l.com. Did you know that in addition to providing you with high quality veneered doors, fire doors and acoustic doorsets we also provide servicing options to our entire Bespoke Ewood door leaves as well as Flamebreak and Blankfort door blanks. We have the ability to be able to undertake the following processes at our factory using advanced equipment which leads to accurate results and meets the individual requirements of regulations and assessments which are required globally. Vision panels can be inserted into any door or door blank from the Bespoke range of products. Two type of vision panel bead are available including te traditional ‘cloak’ type bead oe alternatively a ‘flush’ or ‘quirk’ type bead. Both bead types are available in paint grade and any matching hardwood fully finished. Doors can also be factory glazed in all applications including NFR, FD30 & FD60. Preparing a door for ironmongery is something which can be easily carried out in our factory at Bespoke Complete Services. Door blanks can be cut out in order for a lock or latch, letter plate, flush bolts, air transfer grills etc. A fitting service for these items is also available if required. These services eliminate costly and time consuming works at site. Allowing this work to be done under factory conditions and prior to delivery to site or our customers minimises or alleviates costly on-site servicing or servicing at home, saving you time and money. For more information or call our sales team on 01254 777142, you can also email us at sales@bcs-l.com. Need Your Bespoke Veneered Fire Door in a Hurry? The clock is ticking and you are struggling to find someone to supply you with Bespoke, purpose made doors? 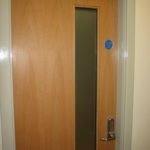 If your need for fire doors, veneered doors or acoustic doors is urgent then there is no need to worry about putting your contract in jeopardy. Bespoke Complete Services Ltd can offer you a reliable solution to your problem. Express Fire doors from Bespoke can be delivered to your project in double quick time, within 48 hours in some cases. With vehicles on standby we are waiting to deliver your order. We are able to manufacture your made to measure veneer fire doors in a number of applications including Non-Fire rated, FD30 & FD60 inclusive of acoustic doors and doorsets with and without glazed vision panels. Our doors can be supplied fully finished in a superior AC lacquer or can even be supplied in the white for onsite decoration and painting to take place. With a full range of commercial veneers in stock, American & European Oak, Steamed Beech, American Ash, Black Walnut, Cherry, Sapele, Koto & primed paint grade the choice is endless. Not to mention that there are lots of other species available too. Bespoke Complete Services currently manufacture a number of doors and doorsets which we then supply to schools, healthcare projects, residential and commercial projects to main contactors as well as various construction companies, shop fitters and sub contractors throughout the whole of the UK. Bespoke Complete Services are a leading door and joinery manufacturer who provide value added complete doorsets and services to our customers throughout the order, manufacture and fitting process. But behind the raw wood, the doors, the door frames there is a heart and we care about where our wood comes from and therefore have a strict environmental policy.So much so we are striving for FSC status and accreditation and are hoping to secure this during the course of Summer 2011. Forests around the world are put into crisis through illegal logging, but not only that deforestation illegally are causing changes to our ecosystem in which we all heavily rely upon in a day to day basis. There is a need for wood for various applications within our society, but there is a right way to source it. Bespoke Complete Services are dedicated to recognising our responsibility. As one of the industry sectors that heavily rely on the wood, the timber that we use, provided to us from our trees is always sourced from legal and well maintained forests. We actually can provide evidence to prove that our suppliers are compliant and are operating in accordance with the laws of their particular country. Bespoke Complete Services condemns illegal logging practices and are very much aware of any changes within international legislation regarding the source of timber. Timber is the most environmentally friendly construction material and within our factory we actually have an energy efficient wood burning boiler and heating system where we effectively burn any waste wood and this then works to provide heat to the factory floor. We are self sufficient and have reduced gas fuel requirement for our offices and factory by a massive 70% so you can rest assured that if the environment is something that concerns you there are still companies out there who care too! Take a look at our full range of products which are completely environmentally friendly. We are experts in Fire Doors, Acoustic Doorsets, Veneered Doors,Paint Grade Doors, MDF doorsets and Performance Doorsets. For more information about our environmental policy and what we can do for you then contact us. Bespoke have this week begun to install & commission our brand new state of the art machinery. This is an exciting time for us as the machinery will enable us to produce our own brand of specialist door and doorsets in our recently completed, purpose built doorset factory. In total there will be twelve new machines which will join the business, and pictured here our the first few which have been delivered. Firstly, our 3100 x 1550 capacity 4 platen 120 tonne Casolin press. The oleo-hydraulics presses with hot plates, heated with oil using precise chromium plated pistons. The next to join us is the brand new Casolin Avant 1100mm twin belt sanding machine which will save on time and be extremely useful to us. The main delivery however is, the Dominion MF6113-W2 Ultra Violet roller coater oven. This will allow us to put that perfect Bespoke Complete Services finish onto all specialist hardwood veneered doors in all sizes up to 1500mm in width. The first 2 sections of the machine can be seen in the pictures on the right, along with the Casolin Press coming out of the container. We expect the installation to be completed by the end of week commecing January 17th and will be fully operational by January 24th. Bespoke Complete Services recently completed a contract which involved supplying a total of 35 doors and post formed IPS panels to a project at The Countess of Chester Hospital. These were for two temporary operating theatres that the hospital currently has a need for. The hospital which, is situated on the outskirts of the City of Chester currently provides a range of medical services which cover the area of Western Cheshire and even North Wales. The doorsets supplied where in fact from the BCS-L E-Wood range of doors. 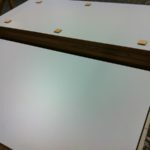 They consisted of a 3 layered particleboard core with an Alpino white laminate facing to both sides. The doors were further edged on all 4 sides with 10mm exposed lippings in solid maple. The factory fitted glazed vision panels contained a sandblasted glass design with a 80mm diameter �peep hole� which is shown in the pictures on the right hand side of this article. The glass was fixed in a solid maple cloak beading system in FF1 FD30 glazing material. The complimentary ironmongery included aluminum kick plates & push plates as well as pull handles and over head door closers which were once again factory fitted. Further to this FD30 fire discs were also factory fitted and recessed into the face of the door leaves in order to meet the HTM58 requirements. The door frames were manufactured in solid hardwood (sapele) & included factory fitted intumescent smoke seals and were fully primed with matching hardwood architraves to both faces. Having the ironmongery factory fitted saved a lot of time and more importantly reduced the cost on site labour.This was yet another successful job carried out to the highest of standards by Bespoke Complete Services Limited. Bespoke Complete Services are pleased to announce the completion of two manufacturing jobs as part of a project at a hospital in the East Midlands. The hospital, Leicester General, is a National Health Service hospital located in Evington. We successfully supplied a number of meter cupboards; they have been manufactured in MR MDF with a Polrey Laminate face & edgings with an incorporated dual locking mechanism. They will be fitted into the theatre wards and used to store medicines and more importantly medical equipment. These are extremely important and have been designed for a specific purpose. The work was carried out to an extremely high standard as always with Bespoke Complete Services and supplied to to our client MTX, who undertook the fit out of the project. A brilliant job was carried out and everyone was pleased with the results that were achieved. In addition to the cupboards that were supplied at the hospital we also manufactured a number of Laminate faced doorsets for a design & build project of a single storey 4000 sq.ft Modular Operating Theatre at the same facility. A number of variations of doorsets where supplied including singles, pairs with and without glazed vision panles, in pre-hung dorsets in both FD30 & FD60 applications. We selected the doors from the E-wood range of door products. Then using a solid particle board construction core with a density of 620kgm3 & providing a fire performance of both FD30 (44mm core) and FD60 (54mm core) we ensured that each door was made to the highest standard. The Polyrey Bleu Ocean Laminate FD30 doors had solid maple exposed lipping with a matching solid maple cloak glazing beads applied to the vision panels. These vision panels were then glazed with 7mm Pyrodur FD30 rated glass in Pyroglaze 30 glazing system. This added the finishing touches to the door and once again we manufactured & supplied and then our client MTX undertook the installation & fit out. All in all both tasks proved successful and we are proud of the high quality work we carried out and results that were achieved for Leicester General Hospital.